Welcome to espina paving inc.
Espina Paving, Inc. is a well-established complete full service asphalt and concrete maintenance and rehabilitation contractor. We are widely known for our dedication and uncompromising commitment in providing quality and timely services at reasonable cost throughout the metro area. 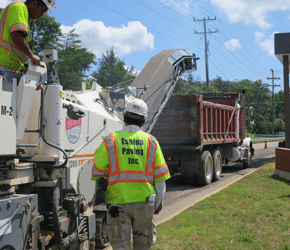 With more than 40 years in business, Espina Paving, Inc. formally Espina Stone Co.’s Paving Division can effectively and competently undertake all of your asphalt pavement and maintenance needs of any size from a pot hole repair to a complete parking facility. Using the latest state-of-the-art equipment with highly experienced dedicated crews we have performed a full range of construction services at numerous properties including apartment complexes, churches, shopping centers, offices, condominiums, industrial and warehouse centers, homeowner associations and municipal projects. With our professional hands-on management staff we insure customer satisfaction and a successful top-quality project. Using the latest state-of-the-art equipment with highly experienced dedicated crews we have performed a full range of construction services at numerous properties including apartment complexes, shopping centers, homeowner associations and municipal projects. As the damage increases in severity, the problem areas must be either skin patched or replaced. 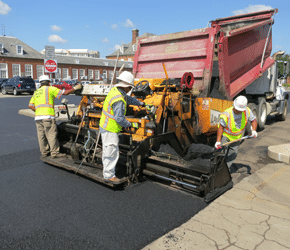 In most cases, the remove and replace method is a better long term value, because it restores the subbase and requires a thicker depth of asphalt. 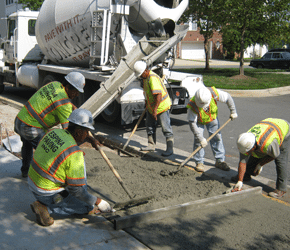 Unlike most other asphalt contractors we perform concrete projects with our own experienced crews and equipment, from new construction to replacing existing concrete. All broken concrete is then delivered to a recycling facility so it can be crushed and reused as an aggregate. Concrete is the most popular construction material for parking structures because of its strength and durability. However, wear and tear can happen over time. To ensure your parking structures can withstand continuous use, be proactive with maintenance. We use an asphalt emulsion sealant that helps prevent damage caused by gas, oil, and UV rays. The sealant creates a barrier against the deterioration caused by the weather and oxidation. It also restores the slate black appearance, while reducing future maintenance costs. Before beginning any work upcoming projects are carefully planned and sequenced in advance with daily adjustments for unforeseen weather and other factors as required. We have experienced managers and necessary equipment to make your project a success.